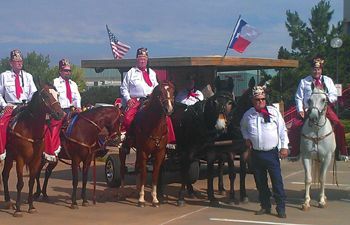 CROSBY  The second weekend of October will see the Shriners Benefit Trail Ride and BBQ Cook-Off glides into the Crosby Fairgrounds. This is an event to raise funds for the Childrens Hospitals, the Burns Hospital for Children in Galveston and Orthopedic Hospital in the Medical Center downtown. October 11, 12 and 13 an event sponsored by the Arabian Knights will feature a free live entertainment dance, a full fledged cook-off with all the fixins and a world class trail-ride and a craft show. The trailride leaves Saturday morning and goes 15 to 16 miles at 9:00 a.m. Charges are $25 for adults and $10 for children 12 and under. Trail ride awards will be bestowed at the awards ceremony that night at 7:00 p.m. Awards go to youngest rider, oldest rider, Hardship, Best All Around Wagon and Shriners Choice Award for showmanship. Sunday morning there will be a short ride. A barbecue lunch will be served to riders. The cook-off is sanctioned by the International BBQ Cookers Association. The Chiefs Meeting is Friday at 7:00 p.m. Friday. Friday beef and chicken fajitas at 6:00 p.m. is turn in time. Cooks awards is due to start at 6:00 p.m. Saturday. A Saturday night dance featuring singer/performer James Garner will follow a huge awards ceremony. All this with a live and silent auction on Saturday night is free to the public. Craft booth interested can call Lisa Orn at 832-212-3166. Interested participants and those with questions concerning the trail ride are invited to contact John Orn at 713-562-8205 or John Arnold at 713-870-8475. Shriners Hospitals for Children®  Galveston provides acute, reconstructive and rehabilitative care for children with burns and other skin conditions. The inpatient and outpatient units are designed to allow children to recover in a safe, fun and friendly environment where family comes first. World-class physicians and researchers are committed to continuously advanced burn care and treatment to children from all over the world. Last year this fundraiser in Crosby raised $15,000 for both hospitals, a total of just over $30,000. Shriners Hospitals for Children®  Galveston, is a 30-bed pediatric burn hospital, research and teaching center. Our family-centered approach to care is designed to support the whole family during the acute and reconstructive phases of a childs injury. Located in Galveston, Texas, our hospital treats children from all over the country and around the world, and has unique relationships with some of the top hospitals and universities in the world. Shriners Hospitals for Children has a mission to provide the highest quality care to children with neuromusculoskeletal conditions, burn injuries and other special healthcare needs within a compassionate, family-centered and collaborative care environment. Provide for the education of physicians and other healthcare professionals. Conduct research to discover new knowledge that improves the quality of care and quality of life of children and families. The goal is to become the best at transforming childrens lives by providing exceptional healthcare through innovative research, in a patient and family centered environment. LYNCHBURG  A new monument denoting a gateway approach to Baytown has been built by that city, on state TxDOT land at Four Corners in Lynchburg. It is near the intersection of Decker Drive and Crosby-Lynchburg Road, and can be easily seen by traffic on I-10. One resident of the area, Samuel D. Sledge, 72, has protested loudly about the new monument, and the name Baytown that appears on its base. Sledge lives on Park Street, north of the monument, but can clearly see it from his front yard. He says he has lived on this street since 1948, and the land for the monument is in Lynchburg, not Baytown. The city border is actually about one mile away. 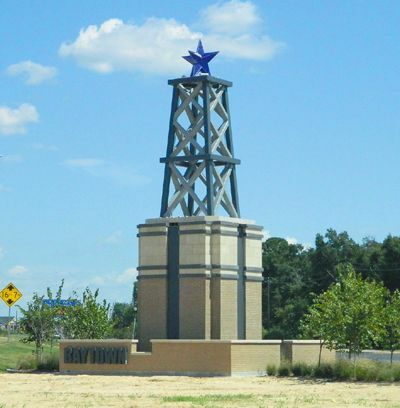 The gateway monument is part of a project initiated by a group from Pasadena known as the Econommic Alliance Houston Port Region, and is responsible for the monuments and the historic portraits that have been painted on oil storage tanks along the San Jacinto Historic District, at Highways 330 and 225, and the Independence Highway, or Crosby-Lynchburg Road. That project was started while Sylvia Garcia was still commissioner of Harris County Precinct 2. The budget for the monuments is about $350,000 each and comes from tax money of the Municipal Development District in Baytown. The monument was built by the Baytown Parks and Recreation department, headed by Scott Johnson. He claims that all permits were secured for the project, and that it was built legally. The second monument is planned for a site near the Hartman Bridge, where Highway 146 and Business 146 split. CROSBY  Monday the membership of the Crosby Fair & Rodeo elected seven board members and those board members voted to keep the same officers as last year. The celebration of a fantastically successful season will be held this coming Saturday, Sept. 14 at 5:00 p.m. A season that would send $35,000 to the San Jacinto Methodist Hospital Cancer Center Endowment Fund and $5000 to the American Cancer Society in addition to numerous scholarships and a premium livestock auction paying generously to the youth that raised them. 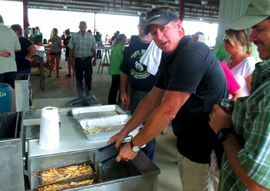 The event called Membership Shrimp Fry is simply a chance to catch up on anecdotes and tales from the previous seasons. Seven positions came up for election this year. Sonny Armstrong, Les Gof, Rick Loggins, Shawn Hays, Billy Nash, Ben Jones and Coy Hearn won the membership election to the board. The officers stayed the same as last years successful team. Rick Loggins stays Chairman of the Board. Sonny Armstrong was reelected to the President. Rick Larkin is First Vice President. Second Vice President is Ronny Ehrlich. Eddie Glover is Secretary. Bill Busby is Treasurer. General Manager is Justin George. Kris Dalquist stays Office Manager. The Fairgrounds will be the location of the Czech Fest on Oct. 6. The Bras for the Cause cancer fundraiser is to be February 8 at the David H. McNerney American Legion Post 658. Although these functions are important to the community the positive notoriety and Greater Houston wide recognition of our area that comes yearly with the Rodeo is ultimately beneficial. They have launched the next season, become a member this Saturday if you have not already or call 281-328-2113 for more information. CROSBY-HIGHLANDS From the kickoff at the local Cougar Football Field until just past midnight Tuesday morning a strange series of incidents and mayhem occurred, some were fatal. According to the local first responders for Crosby, the ambulance service HCESD#5, thirty emergency calls came in from Friday at 7:00 p.m. until Monday at 7:00 p.m. In Crosby during this time there were four Lifeflights, six car wrecks, 3 All Terrain Vehicle crashes, a drowning, a fatal shooting, a pair of cardiac problems, 14 unrelated medical problems and assorted injuries. Tuesday saw two motor vehicle accidents before noon in Crosby. Experienced responders say that on normal weekends one can anticipate 6 such incidents, locally about three of those health related. It all seems to have started, according to some deputies, on Friday at 2:30 p.m. at B.J. Marina in Huffman, a woman was pulled from the water by emergency rescue crews. Her case was one of near drownnning outside of Crosby. 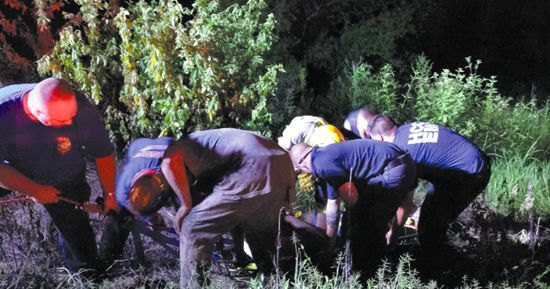 Related to ATVs  one mans extended Saturday was critical at 1:30 a.m. Sunday at DownSouth Off-Road Park just off of the Beaumont Highway. Witnesses say the 30 year old had been drinking and should not have been riding. When he crashed an ATV, he hit his head and fell into a nearby pond. Lifeflight helicopters gave him a lift to Hermann Hospital. Monday at 6:14 p.m. a call came from Cecils on Ulrich that a woman over the age of 30 was found under the water. Her body was take into the custody of Harris Country Medical Examiners Office for determination of facts. The ambulance service in Crosby, Harris County Emergency Service District #5, was willing to issue a statement concerning all the incidents of the Labor Day weekend, according to Christy Graves, We expect to have a busy weekend on most weekends due to the community being at its most populated. However, this weekend was extraordinary to sum it up. We are always prepared to respond regardless of the call volume surge. I do believe there are several contributing factors in our elevated request for assistance; the Labor Day Holiday, the increased number of recreational activities Crosby has to offer, and the elevated temperature (heat) to name a few. Oddly, this weekend we had a large volume of our local citizens out of town for opening season for Dove Hunting. The U.S. Coast Guard has posted several studies related to boating safety and their findings among others indicates: Almost seventy-one percent of all fatal boating accident victims drowned, and of those, almost eighty-five percent were not reported as wearing a life jacket. Seven out of every ten boaters who drowned were using vessels less than 21 feet in length. Operator inattention, operator inexperience, improper lookout, machinery failure, and excessive speed rank as the top five primary contributing factors in accidents.